HomeWorld AffairsBerlin, We Recommend You: Grab the Nato Bull by its Horns! While Chancellor Merkel and Macron have already met to discuss governing the EU together, Federal Germany’s official think tank, the SWP, recommends that Berlin takes the military leadership of both the EU and Nato. Taking due note of President Trump’s position (limiting US influence within the Transatlantic Alliance), the government’s experts consider that there is an opportunity for Berlin to become the controlling mind of Nato in its counter-Russia operations. This opportunity has arisen because Germany has made massive investments in developing its army and creating multinational forces. Germany has to show a “determined leadership” of Nato and lead this military alliance of the “West” towards adopting a new strategic concept. This is what the advisers to the German Government and experts in foreign policy are asking for. The context? The reorientation of Germany’s global policy which, following Russia’s recapturing of Crimea, no longer aims exclusively at military interventions throughout the whole world to guarantee strategic or economic interests, but also at fighting “competing conceptual models” of international policy. It is in the pursuit of this latter objective that the Federal Republic is playing a leading role in establishing Nato’s presence in Eastern Europe— against Russia. In particular, Berlin has the lead role in creating multinational divisions, which are destined to complete the Nato troops stationed in the Baltic States and Poland and aims at being the “spear head” of the Alliance. As the Stiftung für Wissenschaft und Politik (the “Foundation for Science and Politics” referred to herein as SWP) stresses, these can also be sent by the EU at any time and participate in these operations. It is for this reason that the SWP considers that their “importance and scope stretches beyond the Alliance”. measures aimed at “maintaining free trade and access, with no strings attached, to markets and raw materials all over the world”. The government had already articulated its thinking in its 1992 Guidelines for the Defense Policy . However, post-1992, the situation changed. As states like China and Russia “experienced an increasing influence on the economic, political and military plane”, a “multipolar world” is now in its gestation period. According to a recent White Book of the Bundeswehr (the German Unified Armed Forces), in this new world “competing conceptions of how the international political order should be structured” could emerge. Thus, Russia “is presenting itself as an independent sphere with its own “pull factor” and a global vision”. German strategists consider that this fact manifests itself clearly and unambiguously when Russia reseized Crimea. When Moscow insists on operating “independently” in terms of foreign policy, the White Book indicates that this is a “challenge for the security of our continent”. The “second wave” of the conflict: the SWP declares that this will have to focus special attention on confronting Nato’s new “spearhead”, the VJTF (Very High Readiness Joint Task Force). The Bundeswehr was a leader in establishing and organizing the VJTF, which can be deployed in a very short time . SWP goes on to conclude that it is only in the “third wave” that there would still not be “enough planned unity”. The multinational divisions that Berlin had established from 2013 could be very usefully deployed for this end. This is because foreign troops have been integrated into the units of the Bundeswehr ). As the authors of the SWP article indicate, the multinational divisions that are being established have not been conceived exclusively for Eastern operations. That said, their structure in light of these operations bears the imprint of Nato operational plans. To this extent, the current activities of the Bundeswehr forces are determined to a large extent as well, by Alliance standards. So from now on, two of the three multinational divisions must be formed “with up to five heavy brigades…from the personnel and structures of the German divisions”, reports the SWP . Furthermore, the Luftwaffe-Einsatzverband (the operations alliance of the German military aviation) planned in the Nato framework “is based more than 75 % on the capabilities of the Federal Republic”; it is thus “an essential framework for planning how to manage the “German military air force”. Nato’s plans for the navy are translated “before all in the specifications for the zone of command and in a naval command dominated by Germany for the Baltic Sea”. The SWP sums up: “Germany would play a significant role in these alliances and structures on the land, sea or in air”. 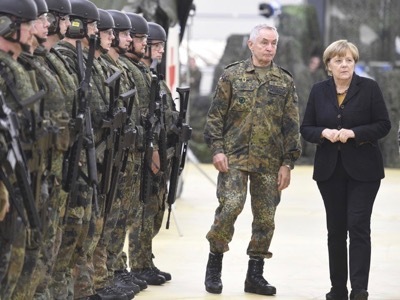 The authors raise doubts on whether these measures for mandatory rearmament can be capped at around 130 billion euro until 2030 (this is the figure the Defence Minister Ursula von der Leyen has announced). However, we must not panic over these costs: “political – military leadership has its price”. In the context of German leadership in constructing multinational divisions, also called “the European pillar of Nato”, the Konrad Adenauer Foundation requests that from now, a new strategic concept for the Western Military Alliance should be penned. Indeed, the strategic concept currently in force, reflects 2010 thinking. Therefore, it fails to take into account two important factors: first, the most recent development in the war against terrorism: the war against Daesh; and second, the conflict that is intensifying with Russia. According to a recent article by the Adenauer Foundation, Nato has probably provided ample progress reports through statements made at the Newport Summit and the Warsaw Summit. But work on a new concept would offer the opportunity to focus the forces within Nato which is everything but “crisis-less”. Currently, the United States is not fully assuming “its traditional role as a leader in the Alliance or at least, not in a reliable manner”. However Germany is “well in there”, executing a leadership role by constructing multinational dimensions. The author of this paper, Patrick Keller, Coordinator of the Foundation Adenauer for Foreign and Security policy, recommends the following: that Germany uses “the political capital that it has gathered by taking on additional responsibility, to consolidate Nato and shape its future” . But the multinational divisions that are emerging are not limited to Nato interventions. SWP reaffirms that formally “only the armed forces of Nato members” participate and these forces can freely decide on their stationing. We consider that these forces would give priority to participating in Nato interventions; but “in theory”, combat formations could also be used “in EU operations” . “Faced with the shocks that took place in the transatlantic relation”, multinational divisions “have an importance that stretches beyond the Alliance”. On this premise, continuing on this trajectory, the Bundeswehr would become “one of the most important armies on the continent”. The SWP writers conclude: “now it seems even more urgent that the debate on the growth of Germany’s importance in Nato and in Europe, offers a bigger place to Berlin”. Finally, the extremely ambitious project for constructing multinational divisions requires a “determined leadership” – and “by Germany”. Verteidigungspolitische Richtlinien für den Geschäftsbereich des Bundesministers der Verteidigung, Bundeswehr, Bonn, 26.11.1992. «Deutschlands globaler Horizont (I)», German Foreign Policy, 14 juillet 2016. Patrick Keller: «Ein neues strategisches Konzept für die NATO?» Analysen und Argumente, Ausgabe 274, Konrad Adenauer Schiftung, August 2017. Rainer L. Glatz, Martin Zapfe: «Ambitionierte Rahmennation: Deutschland in der Nato». SWP-Aktuell 62, August 2017. «Vormarsch nach Osten», German Foreign Policy, 3 février 2017. «Kriegsführung im 21. Jahrhundert (I)», German Foreign Policy, 1er avril 2015. «Unter deutschem Kommando», «Die deutsch-polnische Militärkooperation», German Foreign Policy, 15 février et 17 juillet 2017. Patrick Keller: «Ein neues strategisches Konzept für die NATO?», Analysen und Argumente, Ausgabe 274, Konrad Adenauer Schiftung, August 2017. Rainer L. Glatz, Martin Zapfe: «Ambitionierte Rahmennation: Deutschland in der Nato», SWP-Aktuell 62, August 2017.